This is the fifth year that I have selected a word to guide me in the coming year. I display it near my desk and use it as a mantra when I am in doubt. 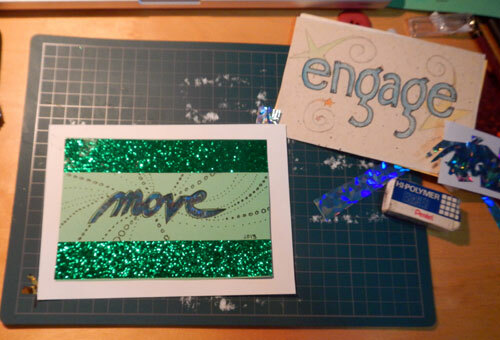 For 2013, my theme is move. This was a tricky one. The first move I think of is "move house" which is daunting and unpleasant but there are so many more definitions that suit what I hope for in 2013. I can move someone to tears or move them to action, I can make a move, move forward, move my body, or learn a new move...or I could move house. Some synonyms to keep in mind: activate, actuate, advocate, affect, agitate, carry, cause, convert, draw up, drive, excite, impel, impress, incite, induce, inspire, instigate, introduce, lead, operate, persuade, prompt, propel, propose, rouse, shift, start, stimulate, stir, suggest, sway, touch, quicken, urge, work on, act, action, change, manoeuvre measure, motion, movement, procedure, step, stratagem, turn, variation. This is a good, goal-oriented way to approach the new year. Engage was good to you, and you related well to the theme!